Two words: I’m back! The last time I shared with you was quite a while ago, and I just want to say THANK YOU to everyone who expressed such KIND words to me and my *drumroll* husband! We’ve been married for almost two months now (whaaaat?! When did that happen??) and not to sound cheesy but it’s been bliss. Like, Netflix marathons with your best friend bliss. Totally awesome. I plan to share some wedding pictures with you in a soon-to-be post but how about we jump right on into these pancakes? So, we are celebrating two things today. 1) These amazing gluten free pumpkin pancakes 2) today is a Surprise Virtual Baby Shower for Cheryl of 40 Aprons!! I thought, what better day to jump back into blogging with you all then a day commemorating such a lovely event! 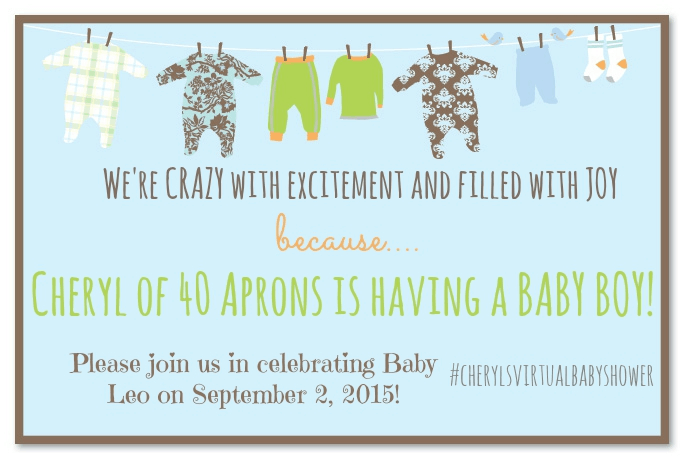 Cheryl is expecting her beautiful baby boy this month and we wanted to celebrate it with a virtual baby shower. I linked to all the other recipes of the lovely ladies who are participating in this, and major thanks to Melissa of Simply Whisked and Meriem of Culinary Couture for organising this! So let me tell you about my relationship with Cheryl a bit. Cheryl and I are what I would definitely describe as pen pals, except via email. I’m not even sure how our very first email interaction went, I just know that when I see an email from Cheryl, I go to grab a drink/brownie (oops), ensure I’m seated and comfy, and sit back for the next 20 minutes or so to read it. We send these REALLY long emails filled with SO much detail that I may burst out in laughter and get a few strange looks from the Mr. I’m pretty sure it began with the fact that part of her honeymoon was in Paris, and me messaging her about it since the Mr. and I went to Paris and Italy for our honeymoon (mostly Paris) and I wanted some great ideas. From then we found out that we definitely both love to travel, share a lot of the same tastes, and both really know how to share a lot of details!! When Cheryl told me that she was pregnant I was SO happy for her!! Cheryl, it’s great having a blogger friend like you and here’s to MANY more crazy long detailed interactions! I hope baby Leo brings you nothing but joy, happiness and lots of love for you and O! So, since Cheryl is having her beautiful baby in the fall season, I thought, uh, why not make something with pumpkin! Pumpkin is by far, one of my favourite ingredients. We use it all year round (cue endless amounts of pumpkin soup like this recipe by my mom!) so whenever it’s fall season, I use it any way I possibly can. 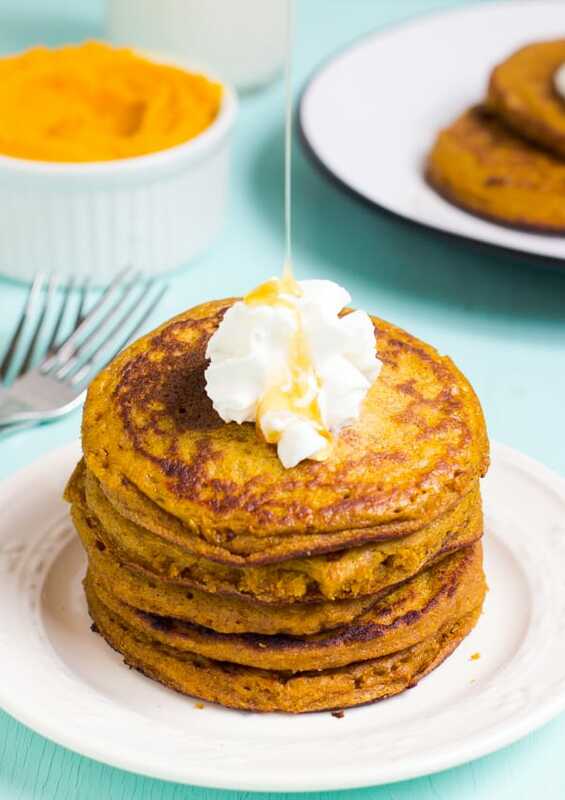 I’ve already made about 8 cups of homemade pumpkin puree in prep of the season, and the very first recipe I made were these gluten free pumpkin pancakes. This is kind of the recipe that was created for busy people, be it busy moms, working moms, or new wives trying to sort out their home but who still want to enjoy the festivities of the season! It tastes just ten minutes to prepare this recipe, and once you take a bite out of your first pancake you’ll be so happy that you made these pancakes. Picture this. Hot, fluffy pancakes with a hint of pumpkin topped with your favourite toppings of whipped cream, a dab of butter, maple syrup, agave or honey or even a sprinkling of powdered sugar. You push your fork into a piece, smear it into the toppings, and take a bite. These gluten free pancakes are soft, light, fluffy and literally melt in your mouth. Recipe testing is probably my favourite past time, and I ran right over to the Mr. saying “try this! try this!” as he tried to read in peace and to my delight his eyes brightened up at the taste of these pancakes. This is major: he isn’t the biggest pumpkin fan, so to win over a non-pumpkin fanatic means that you’ll definitely fall deep for these pancakes. 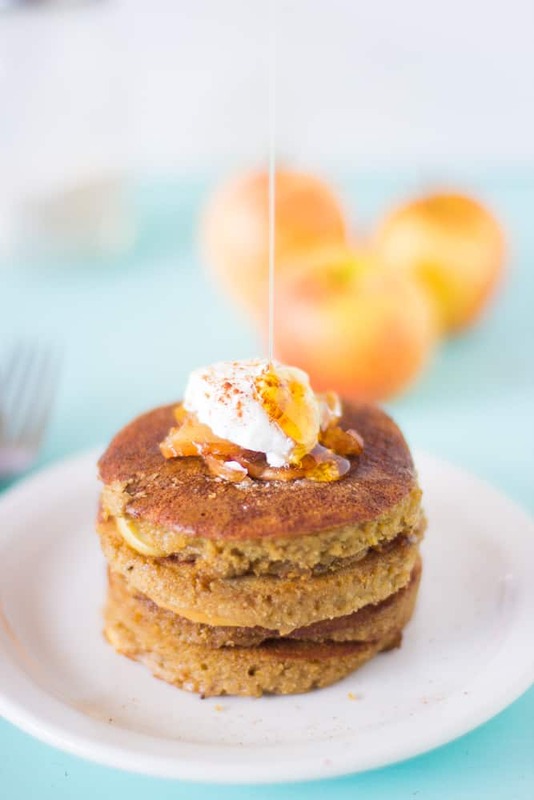 I used ground GF-certified oats in substitute for flour, to create a gluten free pumpkin pancakes recipe with oat flour that you wouldn’t even realise was gluten free. I also personally tested it out, and these pancakes freeze really well. Just place them in a resealable zipped plastic bag and separate them with wax paper. Pop then into your toaster and heat them up until they are ready for business. I plan to make a really large batch one time so that mornings can get even easier for the upcoming fall season. Here’s to many more fall recipes! These Flourless Apple Pie Pancakes! P.S. if you want more quick and healthy recipes, definitely check out one of my favourite websites www.favehealthyrecipes.com ! Pour the batter into a liquid measuring cup, then pour about 1/4 cup's worth for one pancake. Wait until some bubbles start to form on top. Allow to cook for 2 more minutes and then flip the pancakes over. Cook for about 3 more minutes until batter is cooked through. Use thick coconut cream or vegan yogurt instead of the yogurt. You can also use a flax egg – learn how to make a flax egg , instead of the regular egg. You can also use maple syrup or agave nectar instead of the honey. Due to the pumpkin, the pancakes may take longer than usual to cook. Try the first one FIRST, and ensure it’s cooked all the way through, then use that timing for the rest of the batch. I’ve been trying to resist the urge to use pumpkin the last couple weeks, but I think these pancakes may do me in! They looks perfect Jessica! Welcome back Jessica! 🙂 I love these pancakes! Welcome back!!! I’ve loved seeing some of your photos on instagram from the wedding /honeymoon! And these pancakes sound awesome. I need to bust out the pumpkin! Jessica!! You guys are so sneaky and sweet. I totally teared up when I saw all the posts – I’m blaming it on preggers hormones for sure. 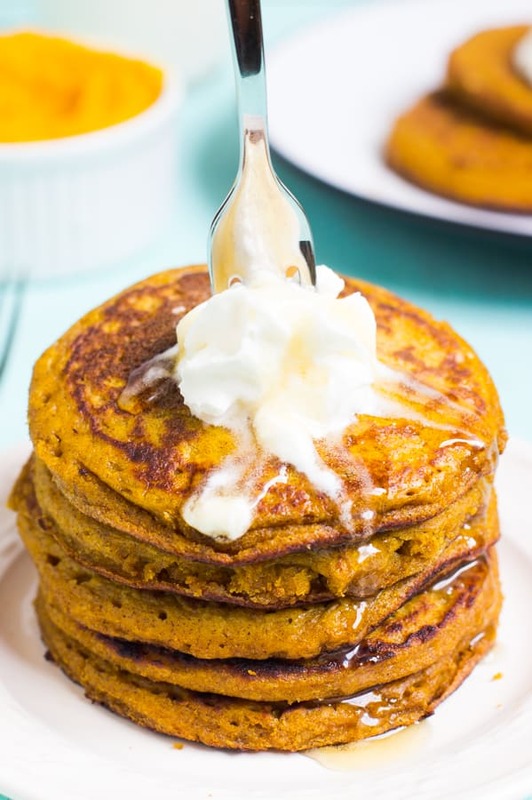 I am ALL about some pumpkin pancakes and have never tried GF ones.. yet. Pretty sure I’ll be making these for dinner (and again, blaming it on preggers cravings.. I can blame a lot on this pregnancy apparently!). Leo and I both feel so loved and grateful to be part of such an awesome community of talented women. Now if we could just arrange a get-together with all this incredible food in real life…. You’re SO welcome Cheryl! And CONGRATS on your beautiful baby boy!!! These look AMAZING!! Glad to see you back in the blogging game girl! Missed you! So happy to see you so happy! Welcome back, and congratulations!! 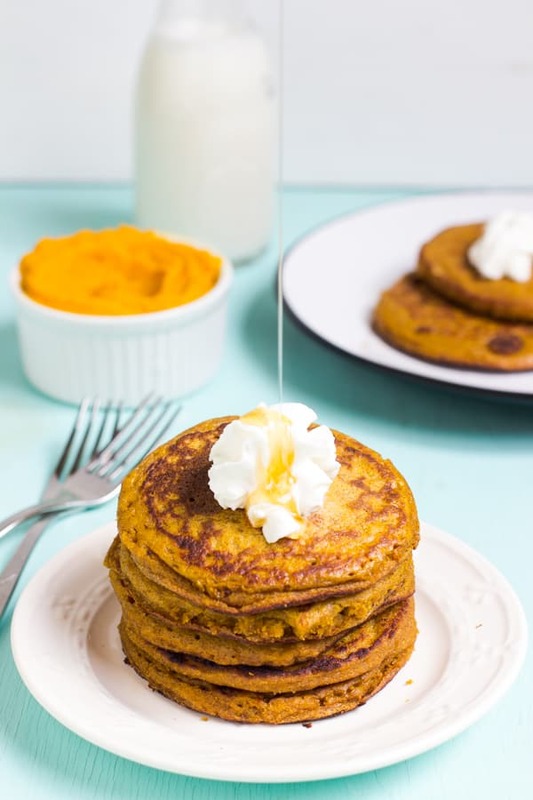 These pancakes look absolutely swoon-worthy – I’m all in with pumpkin already 🙂 love it! Congratulations on getting married and what a fun recipe for the virtual baby shower!! I am always looking for gluten free breakfast recipes for my GF friends! 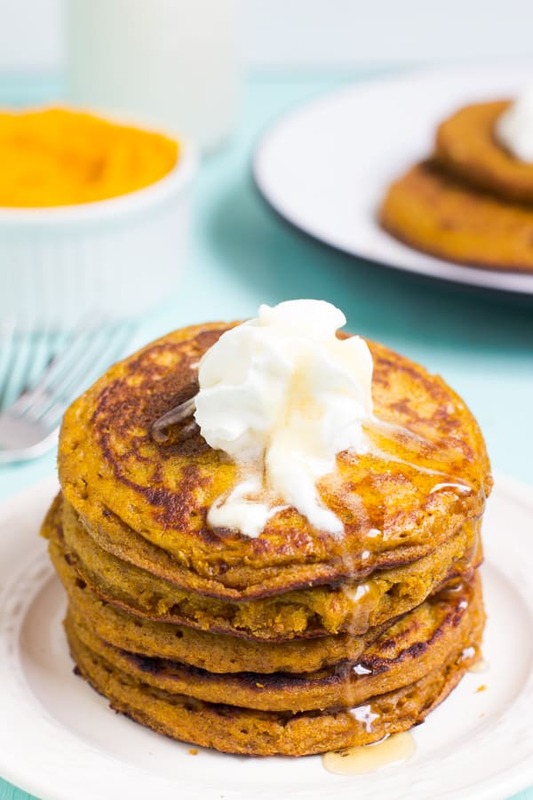 Sometimes, I love breakfast for dinner and your pumpkin pancakes will be perfect for such an occasion! Welcome back, Jessica, and I’m so glad to be a part of this wonderful virtual shower with you! Glad to hear you’re in the throes of wedded bliss! 🙂 These pancakes look perfectly fluffy and delicious, and I’m pinning to try…I love that they’re gluten free! The GIF of you pouring the syrup is so cool! I cant wait to try these! Love that they’re gluten-free! Pumpkin season is my favorite! 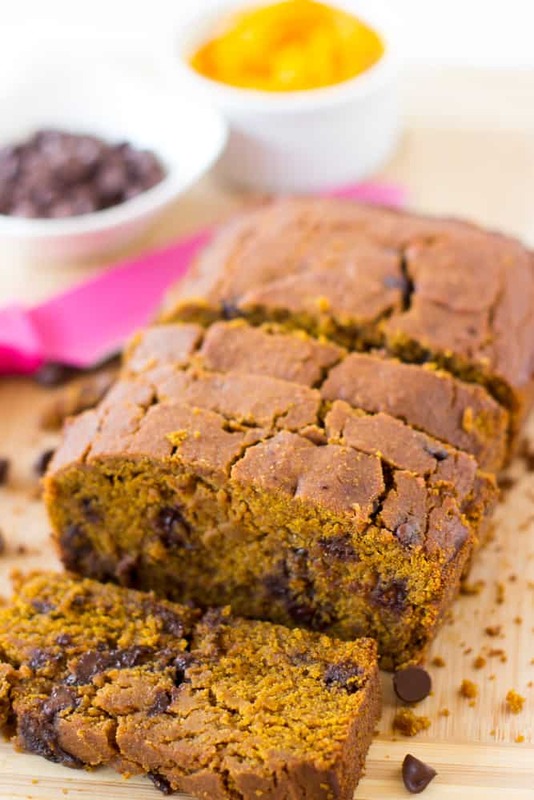 I love putting pumpkin in everything! Your pancakes look delicious, AND they’re gluten free! These look beautiful! They look so fluffy that it’s hard to believe they’re GF. I’ve been meaning to try a GF recipe. I may need to start with these! Aww that is SO exciting! And definitely a great reason to dive back into blogging. I love reading Cheryl’s blog…her photos are always super drool-worthy! I’m thinking of buying my first can of pumpkin for the season this week, and now I know what I’ll be making! These pancakes are FANTASTIC!! I consider myself a bit of a pancake guru…tried all of the whole wheat, oatmeal, paleo and other healthy variations there are. But I just made these and they have now become my number one favorite pancake recipe. What do I love about them? They are healthy, low calorie, fluffy, moist and super delicious. Thanks for the recipe Jessica! I’m SO glad you enjoyed them and you’re so welcome! This comment honestly made my morning 🙂 thanks for the feedback! Welcome back and Congratulations! We love gluten free a must add into our gluten free rotation! Thanks for sharing! Awh, I love Cheryl and her blog! you guys are so sweet! and so excited for everything pumpkin this season! love these pancakes!!!! Oh my goodness, it’s amazing that you captured the syrup dripping on the fluffy pancakes! Pumpkins are almost in season, can’t wait to give this a try! I love anything pumpkin and I love anything pancakes so these will definitely go on my list this fall. Oh and congrats on getting married, Jessica! Hi Jessica, these look great! Do you have suggestions for cutting out the Greek Yogurt? I can’t eat dairy but these look awesome otherwise! I wonder if leaving that out would ruin the recipe? Sorry I’m just getting back to you! If you have full fat coconut milk (from a can) it would substitute perfectly. These will be a great breakfast addition for Fall! No. They should be fluffy and soft. Oh no! It’s so hard to answer since I’m not there with you. If the coconut cream was nice and thick that shouldn’t be the problem but it may be. Was your griddle/pan hot enough before you started? Did you use the ¼ cup measurement? My batter was thick – is yours? 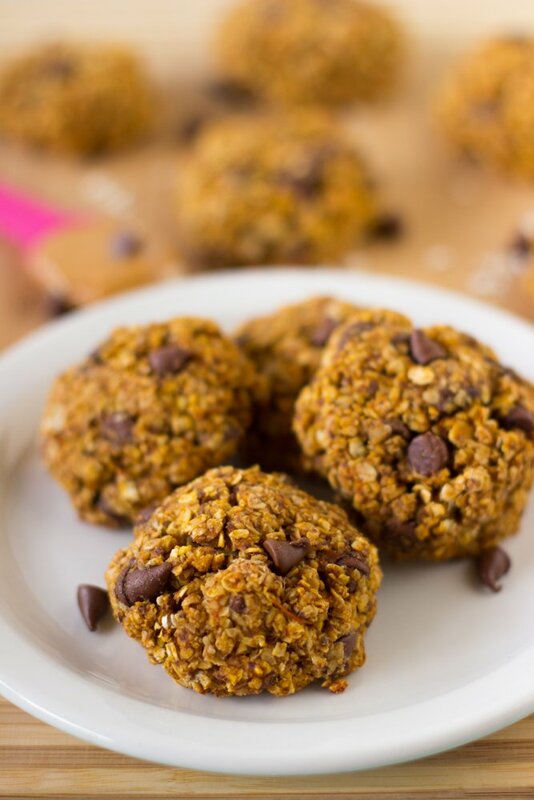 Did you add the right amount of oat flour or change any other quantities such as the pumpkin amount? I would add some more oat flour (about a tablespoon at a time to your batter to help to thicken it up. You can also send me pictures if that helps at ask@jessicainthekitchen.com so I can help you more there or just reply to this in your email inbox. These were so delicious & easy to make! I will definitely be making these alot! Thanks for the fabulous recipe! I will definitely be checking out more of your recipes! Mine did not turn out. They would not flip. Burned on the griddle side. Sorry they didn’t work for you! That’s so unfortunate. If you do try these again, I would suggest checking if you measured out the oat flour correctly and the pumpkin puree, and turning the heat down a bit so they these can cook properly. Jessica, not only were these delicious but your cooking directions were spot on. Being diabetic i have trouble with my blood sugars when I try different flour/starch combinations but I am able to maintain perfect blood sugar levels when I eat these. Thank you times a million for this perfect recipe. Oh I’m so glad to hear you enjoyed these pancakes!! You’re SO very welcome 🙂 thanks so much for your feedback! Mine came out very, very mushy. I followed the recipe to a T. Tastes like oatmeal in the middle. Oh no, sounds like something went wrong for sure! It sounds like they weren’t cooked all the way through for you and that your griddle definitely wasn’t hot enough. They should definitely not only be firm, but completely cooked through. I hope that helps! Can I use regular yogurt instead of the greek yogurt? Hi Julianna! You can definitely use regular yogurt! I hope this helps! In the recipe you list how much baking powder to use but then in the instructions you say to add baking soda as well but that measurement isn’t included in the recipe. Do we also add b.soda as well and how much should be added? I must’ve copied the instructions from my other pancake recipe (which uses baking soda). No baking soda in this recipe! I will work on that! No, it can’t be switched for chickpea flour though! I hope that helps and check back for those nutritional facts! Cooking them now, but they look super fluffy and delicious! Just ate one, a little gooey in the center, but that’s my experience with Bobs redmill, otherwise delicious and super light! If we use coconut cream, should it be refrigerated overnight or can it be used right out of the can as is at room temperature? You should be able to use it right out of the can if it’s the thick cream! I love these!! Did anyone calculate the calories or did I miss it?